To disable or enable folder grouping in Windows 8 / 8.1 or 10 disable this Option in MS-Explorer! ► Copy Windows 8 folder view settings for all folders! ► Disable Windows 8 / 10 auto turn off? ► Turn off the left desktop corner APP switcher in Windows 8.1 / 10 (screen, disable)! ► Can I disable the lock screen Windows 8.1? Disable folder grouping in Windows 8 (remove, turn off)? is not only written for Windows 8, although as you can see above in Windows 8 shot screenshot, you can also use this example to customize the folder grouping as a solution easily and without hesitation on previous versions and for the latest Microsoft's Windows 10 operating systems. The folder grouping does not matter if it's a Windows desktop computer or if you change the folder grouping on the tablet PC, Surface Pro / Go, while you're in Deutsche Bahn. Yes, even on a server operating system, the folder grouping activates itself or the wrong click on the Explorer bar. It's a simple, yet effective solution, the Folder Grouping has been tested and successfully verified on almost all MS-OS. ... In Windows 8 take over view settings of a folder for all folders, but how? 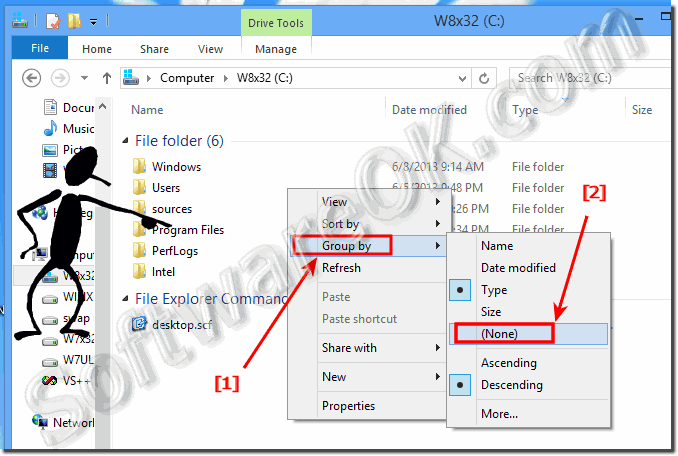 Windows-8 - FAQ-100: Disable the folder grouping in Windows 8, 8.1 / 10 (remove, turn off)?